Grover Norquist, president of Americans for Tax Reform, said that President Donald Trump's tax reform proposal released Wednesday can achieve 4 percent growth. Norquist, speaking at a Capitol Hill press conference Thursday with members of Congress, said tax reform is essentially a jobs bill and will help those who haven't been able to get a job in the last eight years. "We have a jobs bill in front of us if we keep these rates down, we'll go to 4 percent growth, that's what we had under Reagan," Norquist said. "The big winner of tax reform and tax reduction are the millions of Americans who could not get a job in the last eight years and now will get jobs." Norquist says the Republican votes are there in the House and in the Senate to enact the outline released yesterday, but Democrats have no intention of reforming the tax code. 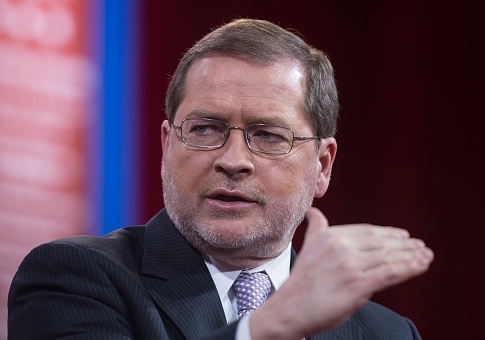 "China, communist China, has a 25 percent rate," Norquist said. "We're at 35 and the Democrats don’t think that’s a problem, they don't think that gets in the way of jobs and growth and opportunity." Norquist also refuted the claim that a tax cut costs the economy. "There's no such thing as how much does a tax cut cost," he said. "Only if you're the government do you think that the peasants' failure to send in more cash is somehow a cost." "Americans, people who work for a living, know perfectly well that tax cuts are pay increases because they stand in the shoes of men and women who work and have a job and create jobs and when they pay taxes that comes out of their take home pay," he said. Rep. Peter Roskam (R., Ill.) also said the economy is not a fixed pie and that the tax plan will help grow the economy. "There are some people who have convinced themselves and are trying to convince others that the economy is a fixed pie, that it's a zero-sum game, that is, if someone is successful that comes at the expense of someone else. We fundamentally reject that, and we're here to demonstrate that it’s not a zero sum game. The economy is buoyant, and if we create an environment where it can grow, people can benefit and the proof will be in the growth that we will see as a net result of this." Chairman of the House Ways and Means Committee Kevin Brady (R., Texas) said the proposal makes the tax code so simple and fair that 9 out of 10 Americans will be able to file their taxes on a postcard-like system with more Americans being able to keep more of their hard-earned money. Brady also refuted the claim that Republicans are raising the lowest tax rate: "Like President Reagan, we lowered the lowest tax rate from 11 percent to zero, we do the same—lowering the lowest tax rate from 10 percent to zero so we ensure that our poor, those with modest incomes, and those in the middle class keep more of what they earn." "So yesterday that was a big day for Americans," Brady said. "House Republicans joined President Trump and our Senate colleagues in letting the American people know we're taking action, action that will bring more jobs, fairer taxes, and bigger paychecks." This entry was posted in Politics and tagged Tax Reform. Bookmark the permalink.